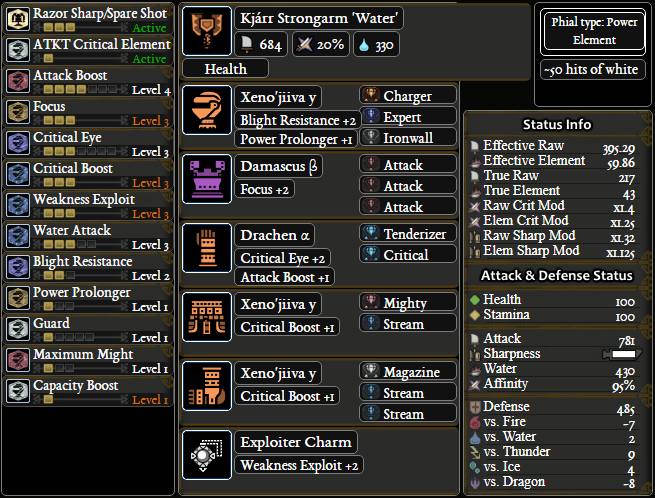 Charge Blade Builds – MHW builds! Charge Blade postgame starter builds, speedrunning builds, and endgame non-meta builds. PC builds are included. New! Check out the Beginner FAQ, currently containing all the shortcuts to perform SAED and all the different attacks with Guard Points, with video clips. Updated builds requiring Kjarr weapons to [PC or console]. Updated Water (Kjarr) MT build for higher fire resistance as suggested by commenter roflwaffles. Added Ice Anti-Luna (Kjarr) build. 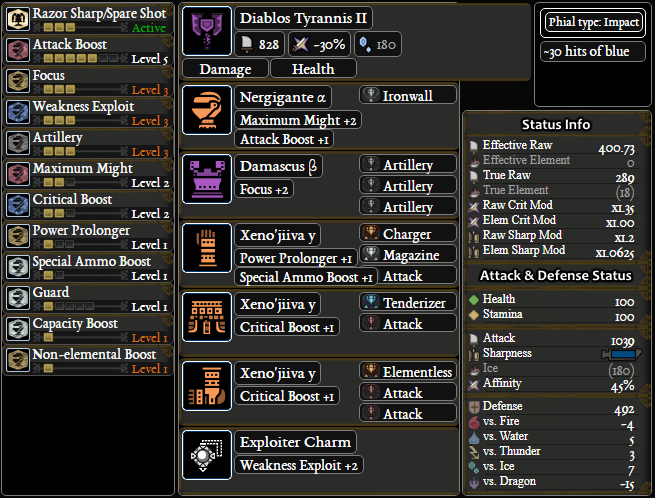 Removed Anti-Luna Diablos builds, except poverty build. Updated builds requiring Xeno Gamma or Empress Gamma to [PC or console]. Added All-purpose Handicraft PC build. Moved All-purpose Master’s Touch back to meta builds since it’s good for PC still. 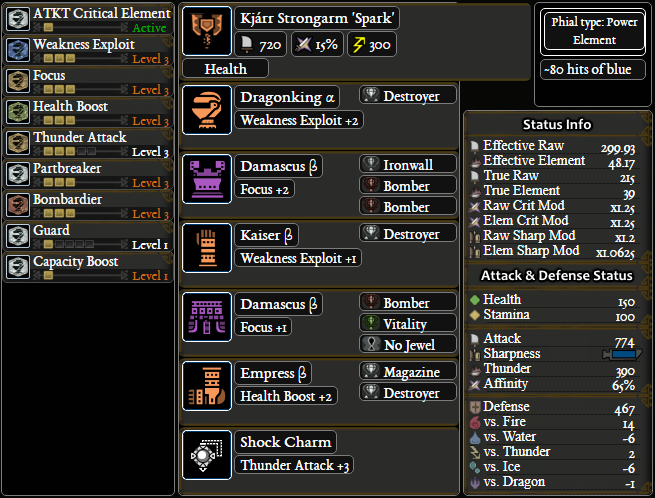 Added Kjarr Elemental CB builds (currently console only). Moved All-purpose Master’s Touch to non-meta builds. Updated several builds to reflect that they are now possible on PC. 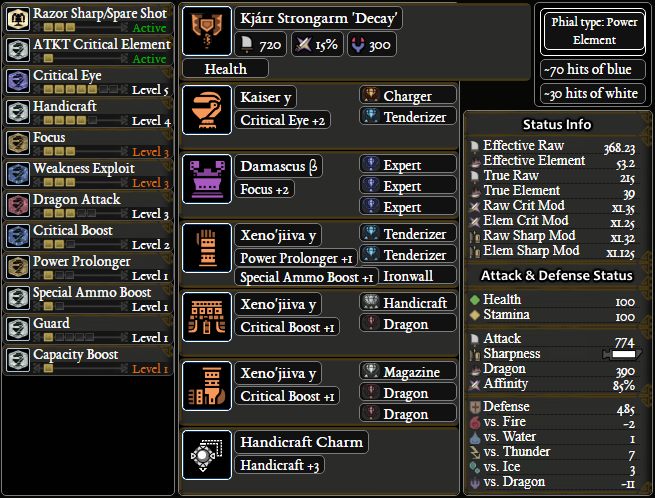 Added All-purpose Razor Sharp console build (requires Xeno’Jiiva Gamma armor). 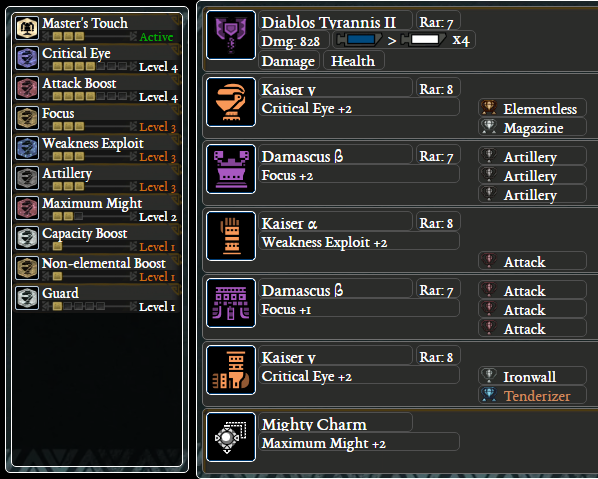 Added All-purpose Handicraft 3 PC build (requires Dante and Lunastra armor). And by popular request, Dante CB builds: for console and for PC. 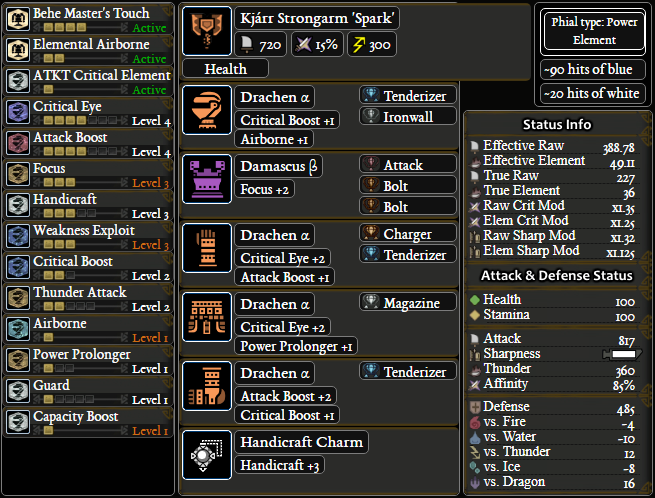 Added tons of updated elemental builds, including Anti-Kulve builds for Console and PC. 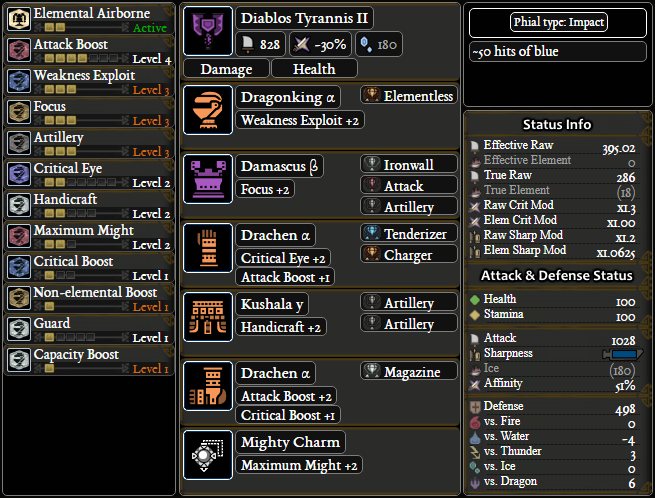 Added several more non-meta console Diablos builds: Agitator 1/2, Anti-Lunastra 1/2/3, Anti-Deviljho, Physical Diablos, Critical Styx. Removed “Required Decorations” from builds, you guys can count. 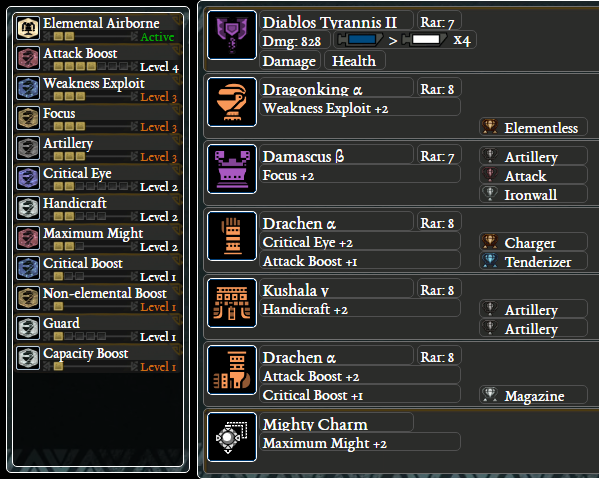 Added Critical Diablos console build. Added All-purpose Flexible Charm (No event equipment) console build. 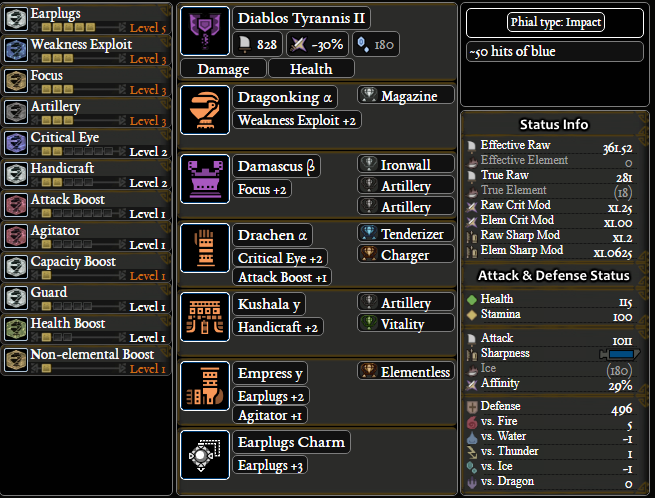 Added Defensive Diablos (No event equipment) PC build. Removed Protective Polish Diablos build as it seems inferior to Critical Diablos and has no real improvements in the near future. Updated build images for starter and meta builds to include effective raw and number of hits for sharpness. Reordered some sets. Will be adding adding more builds and update the elemental CB builds soon. Added [PC or Console] and [Console only] tags to starter and meta builds. Renamed All-purpose Maximum Might to All-purpose Master’s Touch. Added ctrl-F-able [PC] tag to PC viable builds. When playing Charge Blade, after blocking an attack, you may press Triangle + Circle (PS4) to counter with Super Amped Elemental Discharge. However, you cannot do this if the blocked attack was too strong and your character slides back after blocking. You can increase block stability by charging the CB shield, by blocking using guard points instead of holding R2, and by getting Guard skill (these all stack). It turns out that by getting Guard 1, almost every attack in the game can be blocked with small/medium knockback if you have charged shield and use guard points, allowing countering with SAED. Without Guard 1, many strong attacks and even some roars (Bazel, Diablos, Nergigante) can’t be blocked and countered using CB. Focus improves two aspects of Charge Blade. First, you fill phials faster from attacking in sword mode. With no Focus, the fastest way to get red phials is charged double slash, shield thrust, charged double slash. With level 3 Focus (doesn’t work with 2 or 1), you can use a faster combo of advancing/weak slash, charged double slash, roundslash finisher. It also allows some longer combos to charge your shield and end with full phials, demonstrated in this video. The second (minor) benefit of Focus is shortening the charge time for charged double slash and condensed elemental slash. The exact frame data for this can be seen in this video. 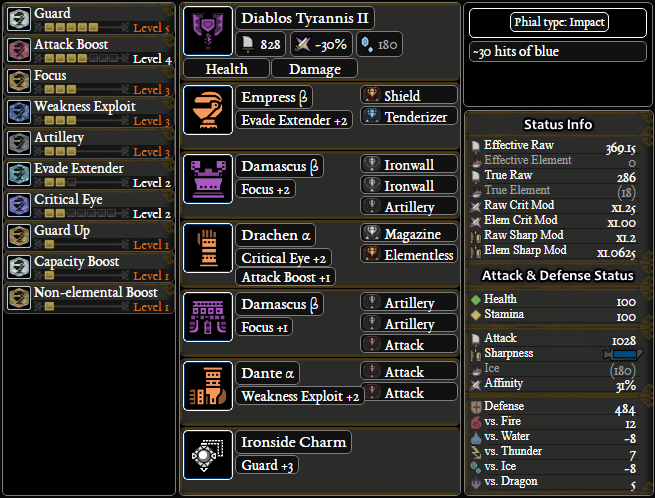 Focus 3 is universally used by CB speedrunners, even those that use elemental CB builds. 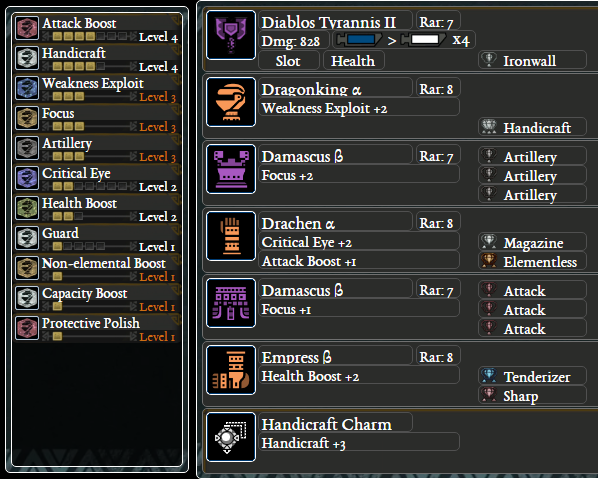 Q: Attack or Affinity augment for Diablos Tyrannis II? Short answer: they are basically the same so choose whichever one you like more. Long answer: Attack wins by a very slight amount. In the SAED-heavy playstyle that speedrunners use, phial damage makes up a large chunk of your damage output, and phials cannot crit and are therefore unaffected by affinity. Phial damage is affected by raw attack, so it turns out that Attack augment gives a bigger boost to your damage even over the 10% Affinity first augment. 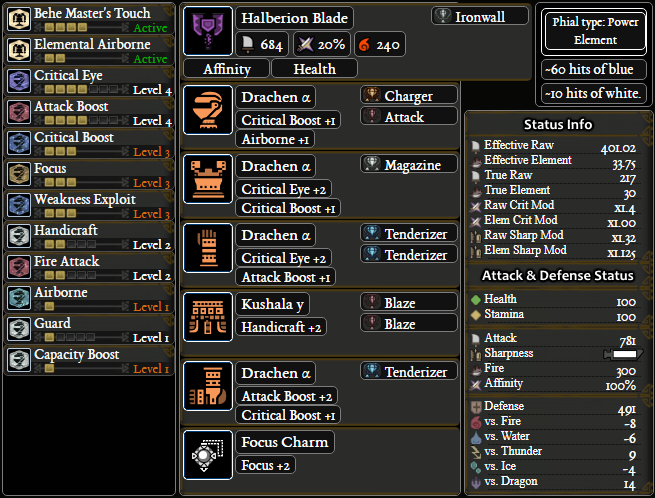 You can observe this by playing with the augments in the builder links below: Attack augment gives very slightly less true raw, but noticeably more SAED phial damage. Q: Why not Attack Boost 7, Agitator, or Peak Performance to maximize impact phial damage? In patch 2.0, phial damage scaling for impact phials was adjusted to use a new formula. Basically, base attack from your weapon and attack from all other sources (non-elemental boost, attack boost, food buffs, power talon, etc) are weighted differently when calculating phial damage, and the base attack from your weapon is weighted twice as much as attack from other sources. What this boils down to is that the difference between 4 attack and 7 attack is only 1 damage per SAED phial, instead of 2-3 damage before the patch. So in my opinion, going farther than 4 attack and non-elemental boost just for phial damage isn’t worth it, except on particular matchups where Weakness Exploit is bad/less good (e.g Lavasioth, Deviljho, Lunastra). As a corollary, this is why Attack augment is still quite good since it increases the base attack of the weapon and benefits from the higher weight in calculating phial damage. 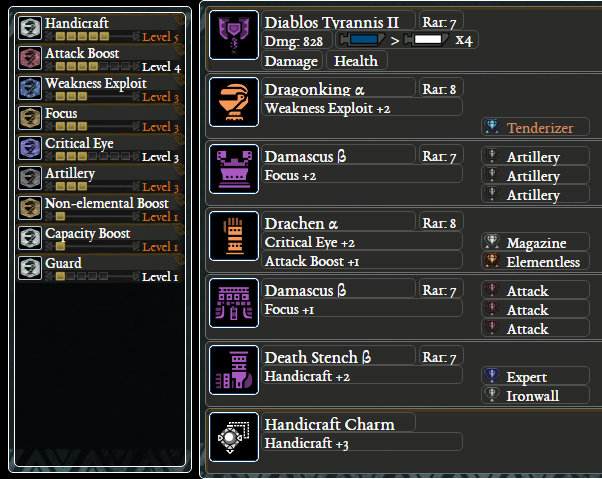 Q: Why Handicraft and Weakness Exploit on Diablos Tyrannis II? Related to the above question. Once you have Artillery 3, Capacity Boost, Attack Boost 4, and Non-Elemental Boost that’s sufficient to maximize phial damage. After that, I focus on improving the physical damage of the CB. When using SAED, the physical damage dealt by the axe hits can easily exceed the damage from phials if hitting a weak point. It’s important to get Weakness Exploit 3 so you can’t negative crit, and Handicraft 2 is very cheap to slot in from Death Stench Legs and lets you stay in blue sharpness longer. This site isn’t just for speedrunners! You can replace Attack or Expert jewels with Vitality (Health Boost) in almost all of the builds below to create a defensive build. If you have it, Taroth Strongarm ‘Horn’ (rarity 7) from Kulve Taroth can replace Diablos Tyrannis II. Both weapons are identical except for Taroth ‘Horn’ giving 10 more defense. You should have 1 free Attack Boost decoration from finishing the story. Add Elementless decoration ASAP! Once you find a Tenderizer and Elementless decoration, you can use the next build. If you value some Health Boost over Attack Boost, you can put in 2 Vitality Jewel in the small slots. If you want Health Boost 3, you can use Xenojiiva Waist B instead of Nergigante. 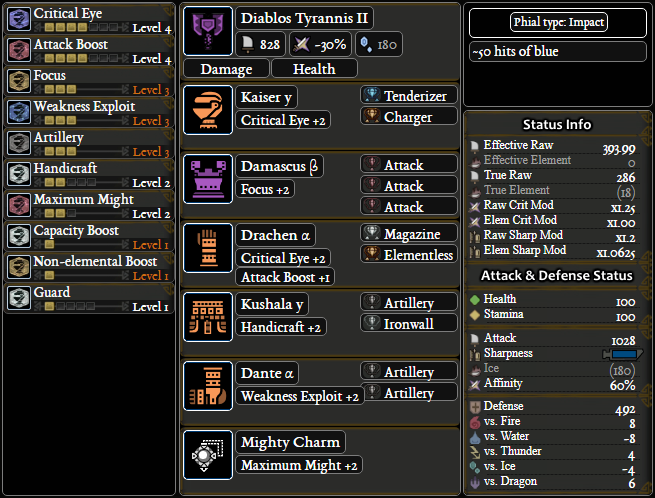 This build uses no Handicraft, but 60% affinity and Master’s Touch effectively gives it 75 hits of blue sharpness, more than the 50 it would get from Handicraft 2. Affinity augment increases this to 100 hits of blue sharpness. However, this depends on Weakness Exploit and guarding can reduce your sharpness quickly. No Handicraft but higher effective raw than meta builds for as long as it remains in blue. The Mighty jewel can be swapped for another Critical if using Affinity Booster or if you like seeing higher numbers. Against some monsters (ex. Odogaron) you can drop the Ironwall jewel for another Expert for more affinity. I generally tell people they shouldn’t use Earplugs on CB since you want to be blocking or guardpointing roars to combo into SAED/AED, but nevertheless here is a decent Earplugs 5 build for CB, with Health Boost 2 as a bonus. 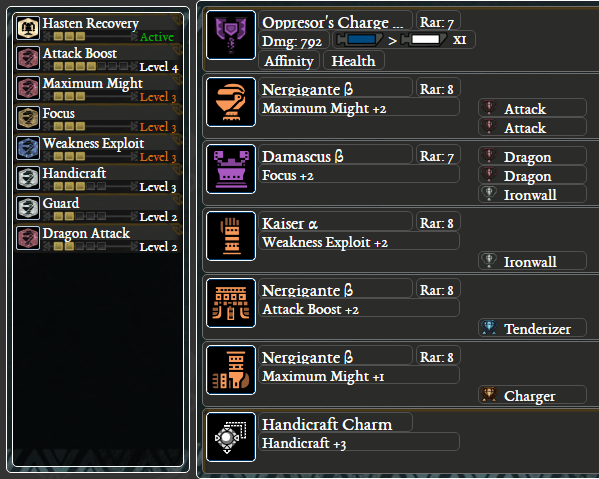 Alternate build with Handicraft 2 but less Attack Boost and Health Boost. Good for monsters with poor hitzones where Weakness Exploit is not as effective, such as Lunastra and Lavasioth. Even more excessive than the above build. Optionally, swap Attack jewels for Health Boost. Since this uses one Lunastra armor, if you’re struggling to kill Lunastra for the first time, put Windproof Charm III on the All-purpose Flexible Charm build and replace Attack jewel with Health boost. This build is an abomination.. with really high raw physical damage. This build is only for Kulve’s “coated” phases (not the final phase) and deals incredible damage when she has a molten coat. Ice builds are strong versus Kulve Taroth’s final phase (no Partbreaker needed). However, they don’t deal stun damage unlike Diablos. I would love to see this updated to include drachen armor options. The lunastra arms can be straight replaced with the drachen ones for extra affinity at the cost of wide range. I’ve been meaning to update the page (I updated the poverty builds for drachen), just holding off until I can also update the elemental ones as well, no idea how drachen shakes those up. Also with AT teo and kushala gear coming, there might be more changes coming soon too. You’re a true hero. This is such an excellent guide/compilation. You saved me so much time trying to learn some of the intricacies I would’ve had to find one by 1 and the builds look really solid. I would love to see more content like this. what would you recommend to swap for the luna shoes for pc players for earplug build? thanks alot for all the build btw. Ive been using dragonking eyepatch, nerg vambraces and coil, dodo greaves b, dober chest, and artillery charm (2 cause I havent gotten Teo gem) and I have no decos. Dont remember alpha and betas for all. Not home. Amazing work. Thank you. One thing, can you post by each build the date it was last updated so we know which builds are up to date? 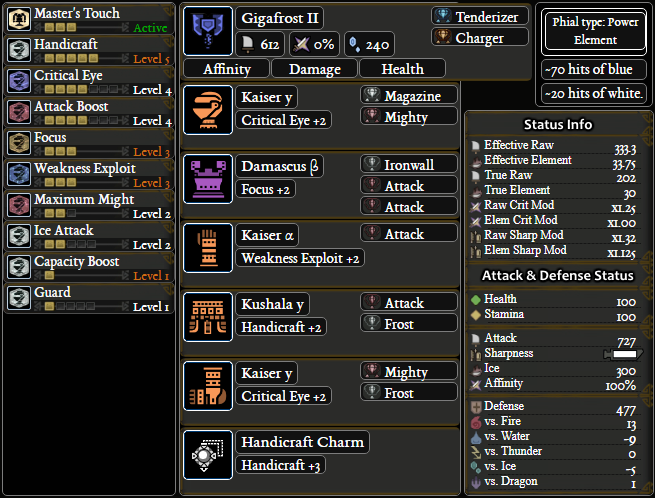 I optimized the SA build from the MHW discord (PC build) if youre interested. Fixed i forgot to replace the mighty gem with crit dmg. Hands down best build guide on the net! OMG!!! Thank you so much.. Thanks for the PC tag. Really useful. Quick question, is focus 3 really that important? Do you have thoughts on good survivability builds on PC? I’ve played the game a a decent bit by now, but I still do get surprised a lot and carting ruins a run for me way more than pumping out neat damage uplifts it. I wouldn’t mind a training wheels suggestion that balances damage and is still able to take a hit from the big hitters like Diabolos and Nergigante. This is great! Thanks! Looking forward for other weapons! 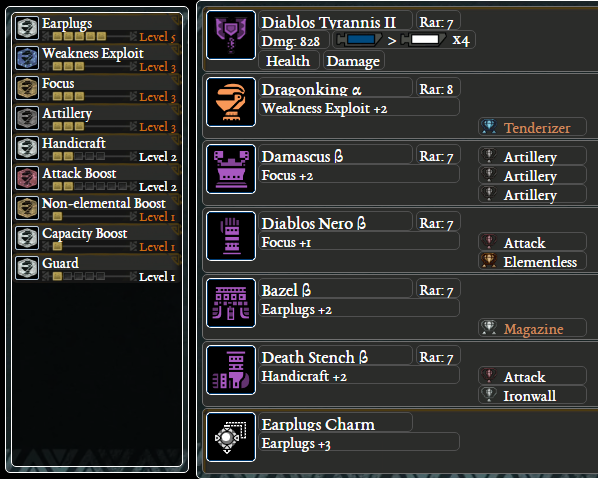 ive just finished my All-purpose Flexible Charm (No special equipment) build (btw the [PC] after it isnt visible ^^) and im trying to get my 2nd augment now. wouldnt affinity be better because then we have positive affinity (with max might) when we dont hit a weakspot and remove the negative crits all together? i know the phials dont benefit from that but i read that they are “only” 30-40% of your damage. im still learning but i feel i dont always hit a weakspot when charging the blade or using my SAED, especially in groups. thanks for your message! I think attack augment is pretty much always better than affinity. When comparing a build with attack augment to a build with affinity augment, the attack augment build will do roughly 0.3% less physical damage (on average) and 2% more phial damage. This is favorable for attack augment unless phial damage is less than 15% or so of your total damage. are there any other viable end game meta PC (no special gear) sets that would be able to compete with flexible charm I and II? Hey do you plan to do this for other weapons, this has been GREAT HELP. sorry, no plans at the moment. Love the guide and have it pretty much permanently pulled up. Had a question about some of the armor you have in your builds though. In some pieces of armor you have listed, Kaiser v in the Master’s Touch build for instance, what is the v variant and how does it have an extra lvl 2 gem slot? I understand this guide was probably made with console in mind, but I haven’t been able to find any info about a Kaiser v piece of armor or how to add a gem slot to a piece of armor. Hey I’ve been looking around on the internet for some CB builds so I’ve been wondering something. How come most CB builds don’t have slugger? I thought CB would be used for the KO utility as well. Or does damage make KO irrelevant/the weapon can KO comfortable anyway? you can use KO charm for slugger 3 on the flexible charm builds, it’s useful only for some monsters because AED/SAED already deal lot of stun damage and in most fights it won’t change the number of stuns you get before killing the monster. I use KO charm for Uragaan and Lunastra (not yet on pc). This is amazing and really helpful! One thing though… in the absolute poverty build, wouldn’t it be better to use nergigante coil and dober armor for attack boost instead of focus? I understand the importance of Focus, but isn’t it lowering down the damage a lot? This way would there would be Attack Boost 5 instead of Focus 3. I’m sure PC will get Dante set soon which will allow one of the sets. But in the meantime here is what I could come up with, it’s missing quite a bit compared to the Dante one though. Thanks for the quick reply, i sure hope we will get the new content at a nice pace. I’m sorry, I’m blind. I saw your crossed it out in your update and a search for [PC] came up short, but I see the tags on the right side. Thanks! I’m trying my best to fit some Focus, Attack, Atrillery, Weakness Exploit, along with Non-Elemental boost, Protective Polish, and Capacity, but I’m having a hard time finding a way to squeeze it all on. Does the latest All purpose master’s touch build have white sharpness? Why not use the Shield gem/Guard up in any of the builds? Is it not worth that lvl2 slot? Only for very few monsters. 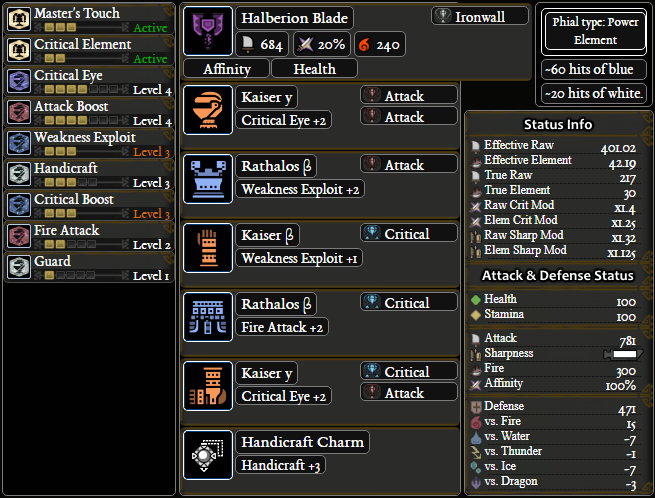 can some1 make good Xeno ra’at CB build..some defense/offense mix, balanced one but viable? 1. Handicrasft 5, Protective Polish, Weakness Exploit 2, Attack Boost 4. 1. Handicrasft 5, Protective Polish, Weakness Exploit 2, Speed Sharpening 3. Good day! 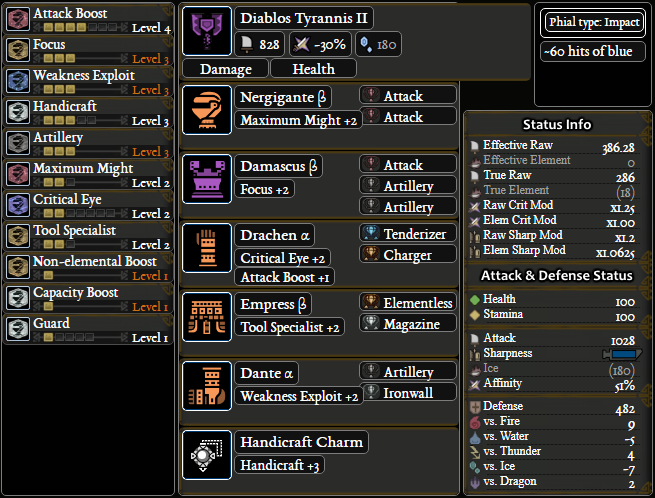 Can you add build using Taroth Strongarm “Thunder” and “Ice”? Or the current thunder and ice build on this list is the best. I think the taroth thunder and ice CBs are not very good, because they have hidden element and also use impact phials instead of elemental. Meaning you need free element 3 AND elemental attack along with all the usual stuff, AND artillery if you want your SAED damage to be increased. It’s just pretty ugly. Do you have Long Sword builds? yes, on other CB I would take affinity before attack. For rarity 6 CBs I would do Affinity, Attack, and then Regen or another Attack. Hey, the Lunastra got announced on PC. Anyone has a PC version of an anti-Lunastra set ? Looking forward if there will be any changes in PC’s Metas with Dante and Lunastra set coming! Thank you in advance! Any Dante build that is recommneded now that Dante is out on PC? there is a new set that uses Dante pants but it also requires Lunastra armor which isn’t out yet. But I have added the build in meta sets. I remember there was a comfy hunting build or something that had 1 Taroth armour and a lunastra weapon? With lunastra coming to PC and Taroth having been around could I get a link? Of course knowing my luck it had some behemoth gear or something. I’ll be sure to add it back when Lunastra is out on PC. 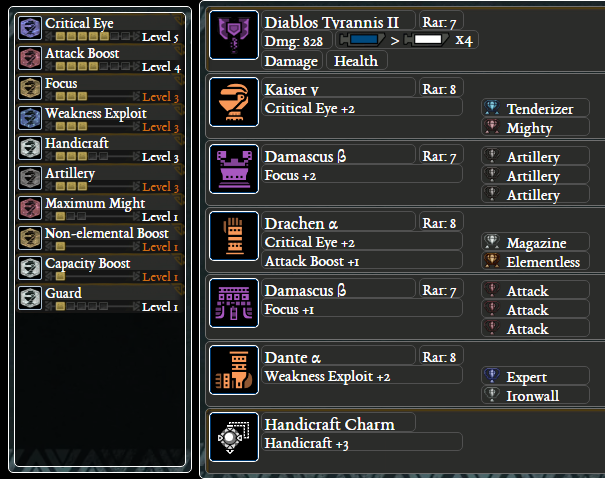 Regarding Dante build for PC, you could trade 2 Crit Eye for 1 extra Maximum Might. you’re right, but for the sake of not having 2 builds, I wanted a build that doesn’t require other event equipment (kulve). But I can add that one as a variant build. Thanks! Quick question here, i came up after min-maxing Dante build for current PC, the only diff with yours is +2 Attack -1 Might (compared mine less 0.44 EFR, -10% aff, -10 def but higher Raw). Do u think it will give a bit better SAED dmg? The 6 extra raw would result in 0.75 extra SAED phial damage. I don’t remember how rounding works in this game so I don’t know which one is better. But honestly the difference is so marginal it’s not going to matter. 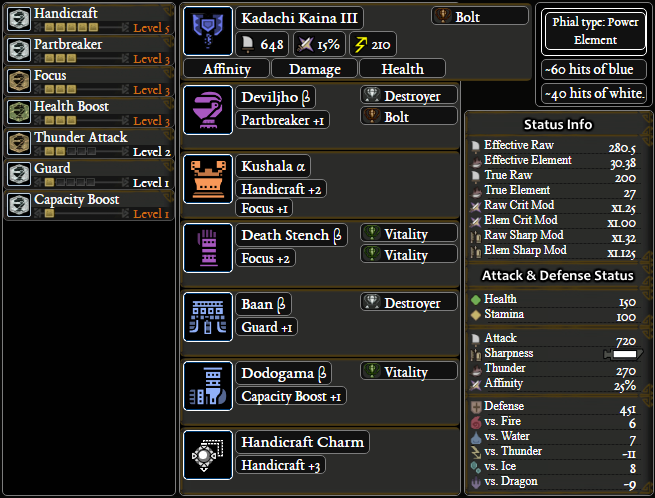 Would it make any sense to put some thunder attack on the dante build vs something like legiana with weakness to it? Anti Lunastra for PC please and thank you! I wonder if they are urban leyends…. Dante build for PC is not optimised. There is extra level of weakness exploit. You can drop 2 level of crit eye, 1 level of weakness exploit and gain 1 level of maximum might. Dragon King a, Damascus B, Diablos Nero B, Nergigante B, Nergigante B, Mighty Charm. Thanks so much for these. It’s been alot of help. Looking forward for Hazak Y and Drachen A sets! Thank you very much! You are helping a lot of players! Give me your thoughts on ff1 for CB in multiplayer. Seems to me the only attack with superarmour in sword mode is charged double slash and I often get flinched by teammates while doing other attacks. as far as I know, in sword mode charge blade has super armor on double slash, load phials, and condensed elemental slash. I personally don’t use flinch free, and when I go for SAED from shield thrust I try to start it from further away so it doesn’t get interrupted. Or instead you can do morph to axe and then SAED to be flinch resistant. i think phys diablo CB on console have something wrong i cant fit crit eye 7 without pull out guard 1 can you check it again and no need arilery ?